A LIC Proposal from is a type of form which is used to enlists the details of the insured about various details of that person. These forms are very essential factor for every insure to enlist every detail. Proposal forms are the most important and basic document required for the life insurance contract between the insured and the insurance provider. It includes the insured’s fundamental information like address, age, name, education, occupation etc. It also includes the person’s medical history. 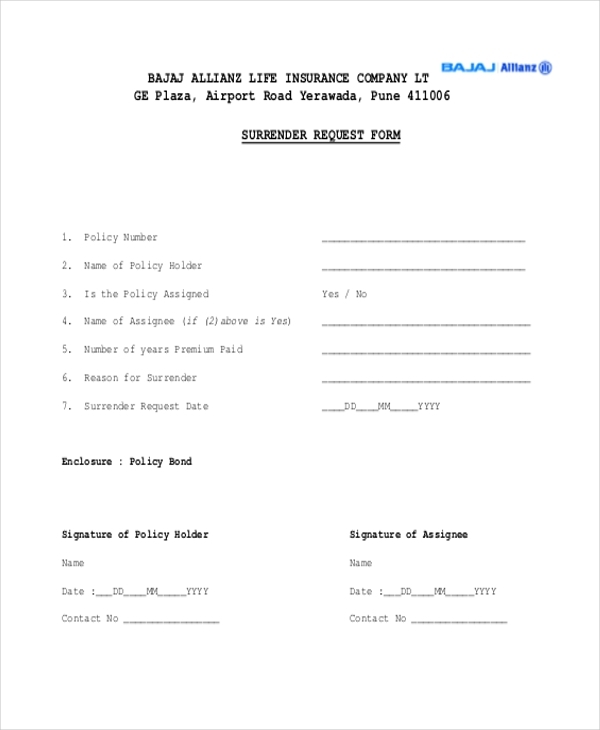 A life insurance company offers a policy on the basis of a Proposal Form. The form is the most basic requirement for the functioning of the life insurance contract between you and the life insurance company. It needs to be completed by the proposer who may seek the assistance of a life insurance advisor to fill it up. This particular form is to enlist details about the insured and the proposer for health insurance policy. Insurance is a form of contract between insurance company and the person want to cover future risk on his life, where the insurer is bound to pay a fixed amount on any incident of health related problems of the insured. This contract starts when insurer accepts the proposal from the proposer on the basis of the details furnished by the proposer in the proposal form (A prescribed format for proposing a health insurance contract). There is some fixed information that the insured need to fill this form very carefully. Details are about: Name, Address details , Contact details, occupation, details about income, education, health issues, Family history and other details, Since the insurance is based on the principle of utmost good faith, it means that the insured person seeking the insurance must disclose all the personal details (health as well as financial or which ever asked in proposal form. 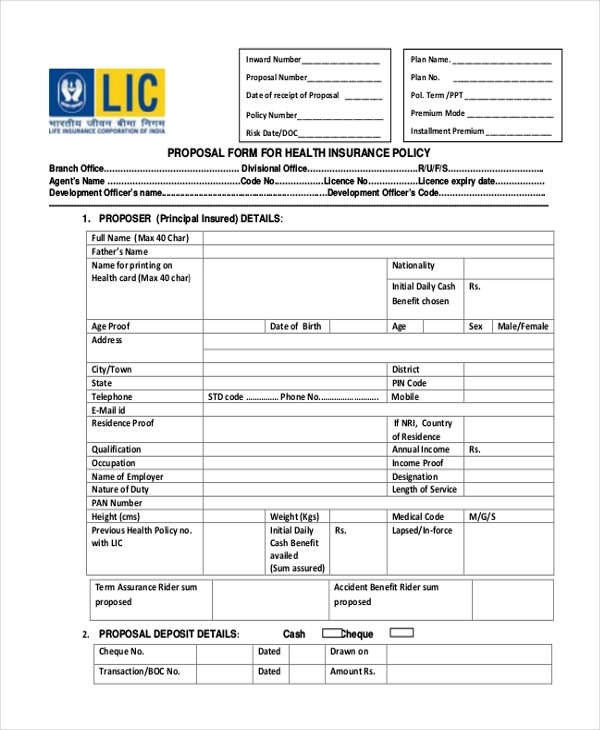 If any Insured want to surrender his or her policies, they must fill this LIC Policy surrender Proposal fill. In this form insured must enlist details about the policy- like-policy number, name of the insured person, Name of the assignee, details about the assignee, number of years that the premium has been paid. The person needs to enlist the reason why he or she wants to surrender the policy. Electronic Payment Method will be applicable to the surrender. This proposal for insurance on own life is to fill up, when a person wants a insurance on his own life. The form must be filled by the insured person, correctly and truthfully as its the basis of the insurance contract. Any column should not be left blank, insured person must not sign any black proposal form. As the insured person will be soul responsible for any information in this document as it bears his signature. Details that need to be filled in this form are, Name of the insured person, Details about the address of that insured person, Proposing the name of a nominee, if the nominee is minor the details about appointee need to be filled, Next the details about the policy must be enlisted in details by the agent or the branch manager, if the person have some previous policy with any other company or LIC, that must be disclosed here in this part. Other details includes: Personal history, medical history, and at the end declaration by the proposer. It’s required when the proposer need to declare some additional matter related to his policy. 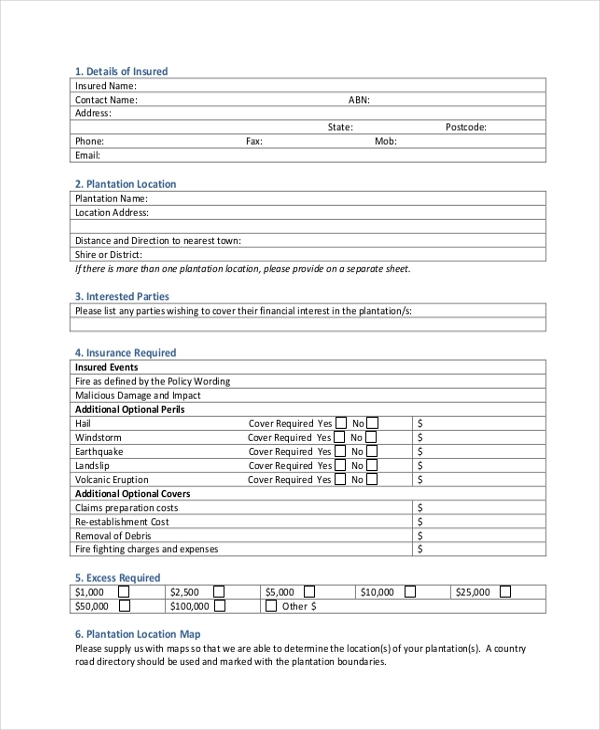 This is a general proposal form, which can be added to any other policy proposal forms, as the additional sheet to add some extra information related to multiple insurance of the proposer. Details include: Type of the insurances that the proposer is proposing: term policy or Any Plan, Details of proposed sum assured, details of the rider included with the policy. LIC Bima Nivesh 2005 is a plan with compound rate of guaranteed additions and loyalty additions . This is the revised version of LIC’s popular Bima Nivesh Plan 2004 and is introduced to meet the overwhelming demand for a single premium plan from the customers . It is a single premium, ideal investment plan for those who have no regular income but good periodical income . Bima Nivesh 2005 is available for terms 5 and 10 years. The guaranteed surrender value is payable after the policy has run for at least one year. Term Assurance Rider is also available by payment of a single premium at the option of the proposer. 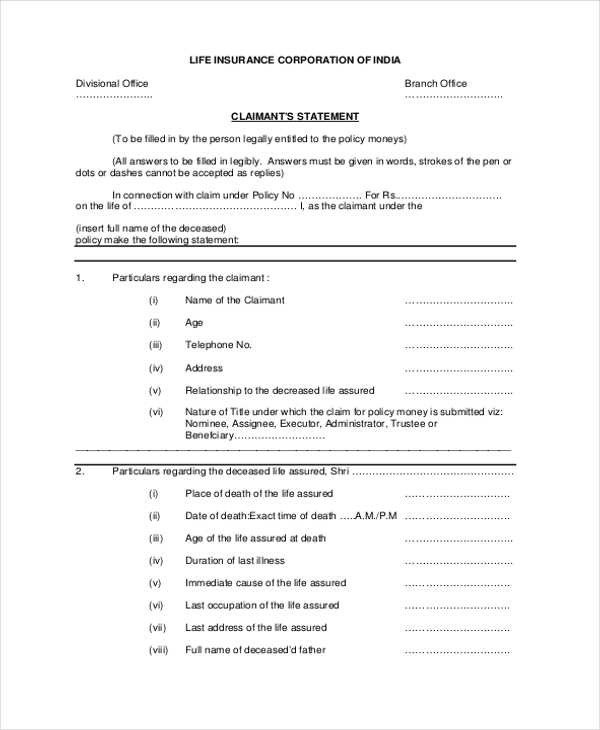 Details that need to be included is same like any other policy’s proposal form: Particulars about the claimant, details about the deceased person, Details about the deceased health before death, a short medical certificate need to be enlisted in this particular form and lastly a very important declaration by the claimant. Forestry insurance is part of risk management system. In this insurance the proposer gets the coverage against the losses caused by natural calamity. In the forestry insurance one also need to enlist details about this forest resource. Plantation Schedule You must insure under this policy each plantation you own or operate that, at their nearest points, is less than 5 kilometres from a plantation insured under this policy. You must also insure the full area of each block within each insured plantation. In this proposal form many details need to be disclosed like, truthful discloser of all details. If the proposer fails to comply with the duty of disclosure, the insurer may be entitled to reduce their liability under the contract in respect of a claim or may cancel the contract. If proposer’s non-disclosure is fraudulent, the insurer may also have the option of avoiding the contract from its beginning. Vehicle insurance is insurance for cars, trucks, motorcycles, and other road vehicles. Its primary use is to provide financial protection against physical damage and/or bodily injury resulting from traffic collisions and against liability that could also arise there from. The specific terms of vehicle insurance vary with legal regulations in each region. To a lesser degree vehicle insurance may additionally offer financial protection against theft of the vehicle and possibly damage to the vehicle, sustained from things other than traffic collisions, such as keying and damage sustained by colliding with stationary objects. Details that must be included, is the vehicle’s license plate number, details about the declarant, and declaration about the seller. Travelling abroad to a foreign land entails a lot of risk. Medical expenses in foreign currency and hospitalization can be prohibitively expensive. Travel policy covers the proposer for all medical eventualities for just a fraction of the amount you would otherwise need. 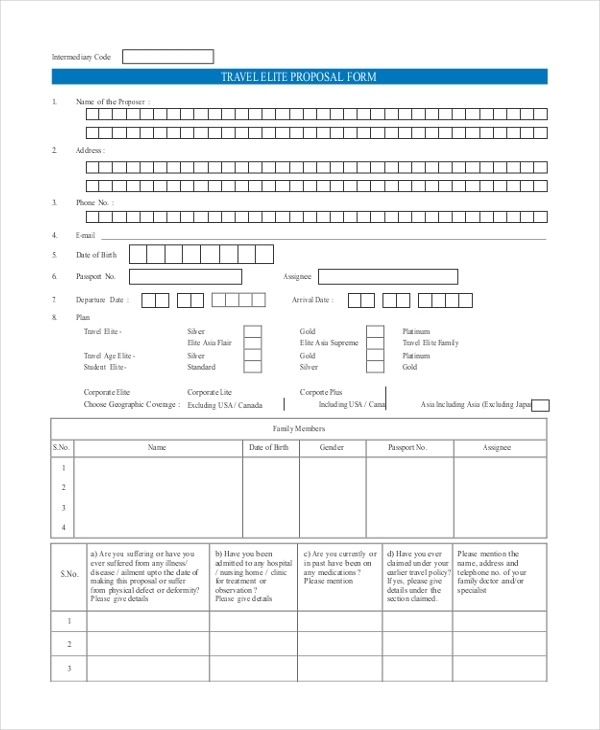 A travel elie proposal form includes various details about the proposer, which must be filled cautiously; some details about the proposer’s current or known diseases must be enlisted properly. General insurance or non-life insurance policies, including automobile and homeowners policies, provide payments depending on the loss from a particular financial event. General insurance is typically defined as any insurance that is not determined to be life insurance. Detail needs to be included very cautiously. What is a LIC Proposal Form? A proposal form seeks basic information of the proposer and the life assured. This includes the name, age, address, education and employment details of the proposer. The proposal form also gathers information on the medical history of the life to be assured. There are questions pertaining to the health status of family members of the life to be assured. The proposer and the life to be assured have to mention their incomes in the proposal form to satisfy the insurer about their ability to pay for the insurance and the need for insurance, respectively. Proposal form helps the insurance company to calculate all the potential risks in relation to the insurance policy and hence deciding the premium amount. Fast process of policy’s documentation-Through this form the insurer can easily know about the detail of insured. It is considered to be the only actual proof- No other document is needed, if this form can be provided for documentation. 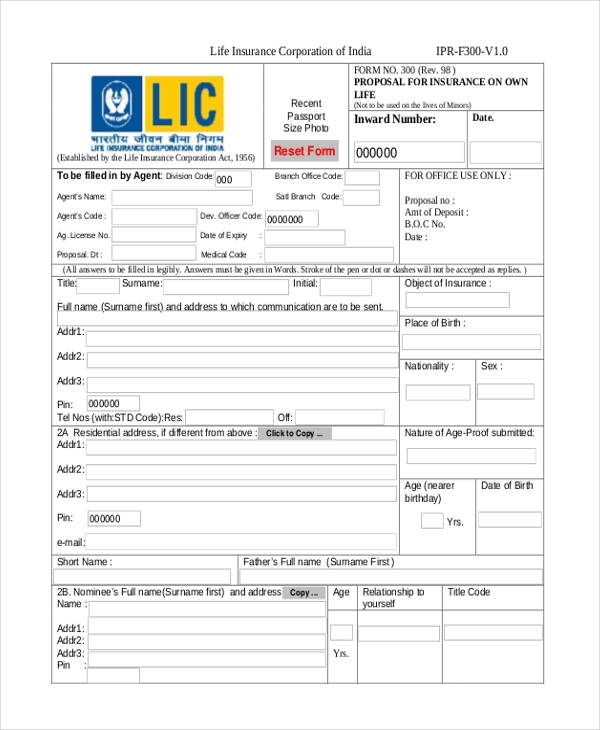 The use and purpose of a LIC proposal form is to enlist all the details of the insured person. 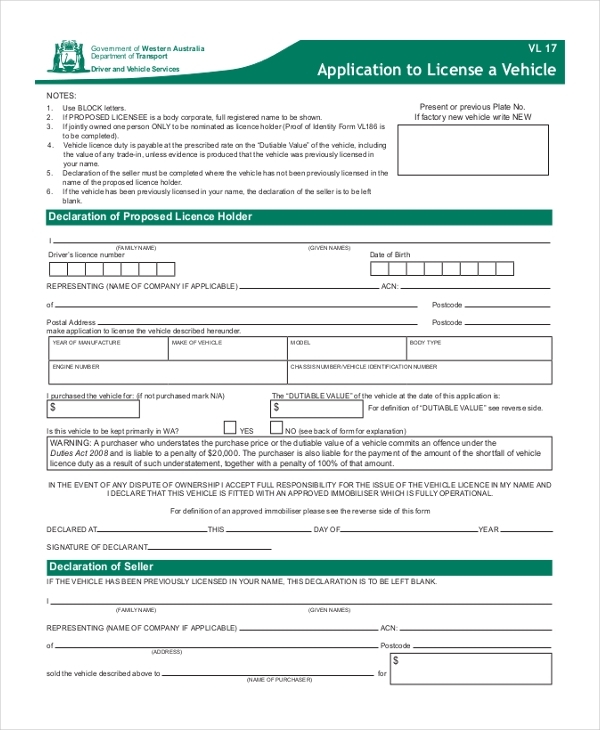 This form is the only legal proof in the process of insurance. 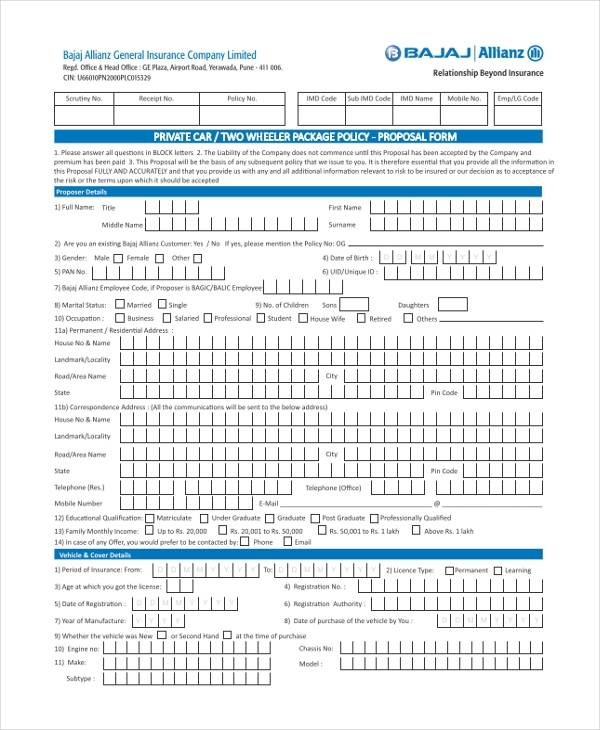 All form of travelling expense is done with the help of this form. Every organization keeps a proposal form from for the insured and grants them the amount on the basis of the details given in the form. 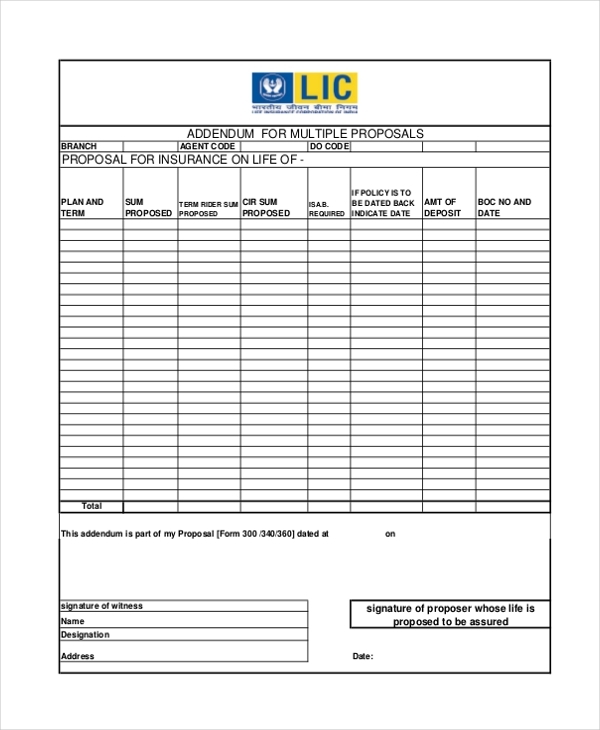 A LIC Proposal Form is a type of form which is solely used as a document for the purpose of insurance. This particular form is used by more or less every industry in the process of insurance. This form enlists all the details about the proposer and the insured within a particular period of time.